“Four hundred years from now a deadly virus and nuclear war have destroyed the modern world, and those who survived have returned to a medieval-like age of swords, horses, and feudal kingdoms. Yet the breathtaking mountain realm of Chiveis lives in peace, protected from the outside world and obedient to its own gods. Though this noble civilization seems to flourish, Christianity has been forgotten—until a mysterious book is found. Yes, keep the nausea down, especially those of you who (like me) feel slightly uncomfortable with the quality of ‘Christian fiction’ – if you’d even touch that genre with a barge pole. The premise of this book is what got me intrigued: what would it look like for the good news of Jesus to start over in a world that once had the truth, but it became lost? I found a free audio-book copy of the first book (The Sword) and used it to pass the time on car trips. 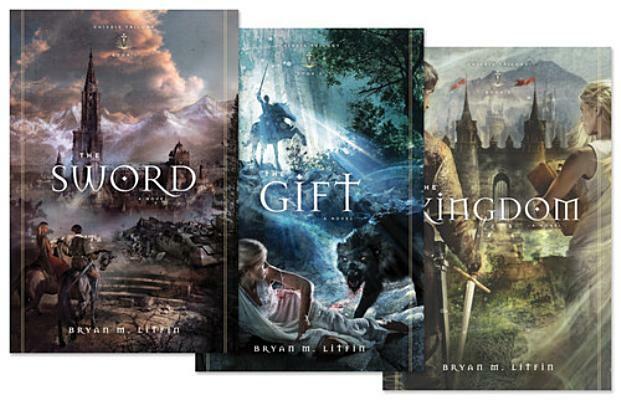 Book 2 (The Gift) and 3 (The Kingdom) were then recently devoured via a Kindle. What is good about the trilogy is that the plot carries: it is not that there is fairly novel idea for a book which by the second of the series has spluttered and died a terrible and mangled death. No, it actually carries. And it carries coherently, with an interest peaking geographical setting (try a ‘where in the world are they?’ as you’re reading), interspersed (at least to my delight) with intermittent droppings of French (oui, and Latin (et al.) as well). Don’t worry, the book is in English, the French and other languages are just there for… well you can find out for yourself. A number of delightful ‘pauses for reflection’ appear as the story unfolds. I couldn’t help but be struck by the beautiful simplicity of the early gatherings as captured in book 1. A clandestine meeting with a limited grasp of the truth and yet there is a simple attractiveness to a Psalm being read, the group sharing their initial thoughts on the passage (chaired by one of the men), and it being thoroughly God-centred and practical to what it means for them to know and live with this God. They didn’t get it all (they didn’t have it all), but they got enough and acted on what they knew. These by-the-by ‘let’s consider Scripture for a moment’ instances occur throughout the books and are really a lovely picture of Scripture integrated into life in the way that I’m certain would be good for us. As the story unfolds, the New Testament only gets discovered later in the trilogy and so, it was likewise interesting thinking about the difficulty of knowing God and his purposes in full with only the Old Testament. Although at times a bit forced, I appreciated the questions of the characters used by Litfin to give a hunger for knowing fully what the OT promises were pointing forward to: especially in terms of suffering, the promised King, and how the two might fit together. The characters for the most part had depth to them. Struggles, temptations, and falling into sin were not glossed over. Characters showed internal turmoil, even those trusting in God. Psalmic cries in their sufferings of ‘Why’ and ‘How long’ were heartfelt and thankfully not portrayed as needing to be hushed up. We were involved in the faith journey of some of the main characters – invited to see the highs and lows within that. There were some Paul-like conversions (even the turning of a whole city – yay!) but then also refreshingly, Litfin didn’t turn simplistically to everyone being converted – one of the major characters remains ostensibly unconverted by the end. It raised issues of free will, the body, the self, and worship. Best of all was the reminder in book 2 (The Gift) of humanities creation in the image of God, giving intrinsic value to those in society seen as less human or worthy (in this case, those called ‘Defectives’) – surely worth a pause for reflection there in terms of who that might apply to in our context. In terms of critiques worth noting: For me, the gorgeously-able-daring heroine Ana and the intelligently-manly-handsome-speaksIdontknowhowmanylanguages-soldier hero Teo, actually detracted from some of the truth contained in the trilogy. Here we have the quintessential handsome dude and pretty girl as main characters – both exceptionally gifted to boot. It seemed at odds with, for instance book 2, where Litfin did a superb job in highlighting the upside down nature of the kingdom of God, exemplified in the Defectives becoming the Beloved. Those upheld or esteemed by society (for whatever reason) are not necessarily those esteemed by God. God is the God who uses weakness, as seen most clearly in the Cross of Christ. With a God who sees beyond appearances, some of the weight of truth in the trilogy was lost in focusing so frequently on the attractiveness of the hero/ine – it simply felt clichéd and Hollywood-esque. And no I’m not saying that God doesn’t save or use ‘attractive’ people – I simply pointing out that it didn’t feel all that much different from who the main characters of the world are, and I’d have liked to see Litfin think a way around that. What could he have done? Should he have done something? A definite mitigating factor was that Ana and Teo suffered and were humbled often – they didn’t stay high and lifted up, despite the fact that they were quite obviously ridiculously ridiculously good looking. Linked to this however, I did have brief moments of concern as to the sexual nature of the books at times. Don’t get me wrong (! ), there were no explicit elements or anything like that. But it did keep being hinted at. Truthfully, I’m not entirely sure what I think about that. I had some other minor and major concerns but, like above, they were mitigated enough to let me largely be ok with them. As a whole the trilogy made me think at the right times, which I appreciated. And despite the real qualms noted above, there were definite moments when it actually warmed my heart as a Christian! It encouraged me to dream big as I joined the characters’ desires in seeing the truth of Jesus go out to all, whatever the cost. And it made me appreciate having the revelation of God in Scripture regarding His Son and His plans. Look, there’s more to say and perhaps a bit more to be critical on, but all in all, wrap some of what I said into a simply good rollicking storyline of adventure and well… it was pretty fun to read! Litfin, Bryan M. (2012-06-08). The Kingdom (Chiveis Trilogy) (p. 231). Good News Publishers. Kindle Edition. The thought of the day saps. Leaving me still in bed. Oh, Come Lord Jesus, come! Come usher in the new. Glory of God revealed, in full. A strength when we have none. your cross and sin bearing goodness. So, you wouldn’t be OK with her pastoring a church, but you’d read her books?